Jack Dorsey, CEO and co-founder of Twitter, is worried. 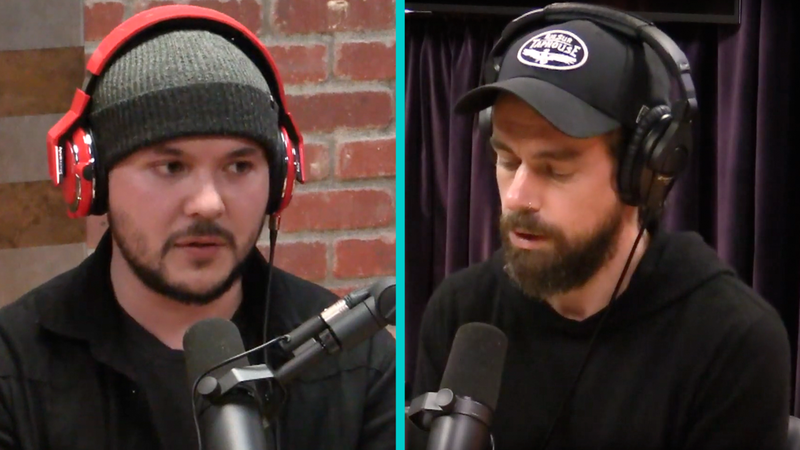 In February, Dorsey appeared on Joe Rogan’s wildly popular The Joe Rogan Experience podcast to discuss perceived bias and censorship on Twitter. It was a disaster. Rogan’s audience down-voted the episode at a staggering ratio of over six to one. Dorsey was widely criticized for giving evasive, bromidic answers, and Rogan was simultaneously lambasted for lobbing softballs and for failing to press harder when it hurt. Both participants needed to redeem themselves, so on Tuesday — a scant month later — Twitter’s CEO jumped back into the fray. For those who were paying attention, the most recent episode was a disturbing peek inside Twitter’s dysfunctional conscience. The first clue that something was rotten in the state of Denmark is the fact that Dorsey didn’t come alone. This time, he brought a lawyer: Vijaya Gadde, Twitter’s General Counsel and head of Public Policy and Trust & Safety. On one hand, bringing Gadde made sense. After all, Dorsey could reasonably anticipate questions about Twitter’s policies and rationale behind specific actions the company has taken. On the other hand, bringing his lawyer is a cunning way of framing the debate. It focuses the conversation on policy and implementation while discouraging a philosophical discussion about the morality of censorship, the principles behind the freedom of speech, and the ethical precepts by which the company operates. Indeed, Gadde was eager to lookup the minutia of specific cases on her computer in real time so that she could rationalize company actions in a contextual vacuum, devoid of any analysis regarding the internal consistency of Twitter’s ad-hoc collection of moral clichés and subjective, contradictory, or ideologically-driven rules. Fortunately, Joe Rogan brought back-up as well: independent journalist Tim Pool. Pool, with occasional help from Rogan, pressed the Twitter execs to justify the recent banning of several high-profile accounts, including Alex Jones and radical feminist Meghan Murphy. He also called them out for banning Gavin McInnes and members of the Proud Boys while conveniently failing to notice that several Antifa accounts routinely promote and threaten violence with much more gravity. Most importantly, Pool was relentless in turning the discussion back to broader ethical issues and the cultural impact of Twitter’s ideological manipulation. The resulting conversation painted a bleak picture. Below are my four takeaways. As evidenced by comments from Gadde and Dorsey, one of the most striking revelations was Twitter’s apparent solipsism. For example, when it was pointed out that by tweeting, “men aren’t women,” Meghan Murphy was simply expressing a (well-reasoned, scientifically unassailable) statement of belief, the Twitter execs appeared unable to fathom the idea that such a statement could be anything other than an abusive insult aimed at the person with whom Murphy was arguing. Both Pool and Rogan tried to explain that reasonable, non-ban-worthy people disagree with the notion that the concepts “men” and “women” should be unceremoniously severed from their biological origins without so much as a public debate on the topic. The ensuing discussion felt like watching someone try to explain to a two-year-old that not everyone likes chocolate ice cream. Eventually, you just give up. “Context,” Gadde insisted, required that such a statement be classified as “harassment.” Buh-bye, Meghan! When Pool brought up the topic of banning people simply for using the phrase “#LearnToCode,” Gadde spiraled into a fragile narrative about how some reporters received a deluge of tweets and some of them contained “#LearnToCode,” and some of them contained “coded language that was wishes of harm.” And some of them were from known bad accounts. And she heard a (false) rumor about real life attacks against reporters. And, had she mentioned the phrase, “looking at context” lately? And hey, maybe “#LearnToCode” secretly means, “I’m going to steal Oliver Darcy’s ham sandwich tomorrow at 12:37 EST.” You never know. So, naturally Twitter had to suspend the Editor in Chief of the Daily Caller when he retweeted the Daily Show and wrote “LearnToCode” underneath. Capiche? Eventually, it was obvious to everyone in the room that Twitter’s justification for the “#LearnToCode” ban was, as Abe Lincoln would have put it, “as thin as the homeopathic soup that was made by boiling the shadow of a pigeon that had starved to death.” Twitter owed descent people everywhere an unequivocal, heartfelt apology. “There are for sure probably mistakes in there,” Gadde offered flippantly. Who needs self-awareness when you have access to a private jet? Perhaps not surprisingly, the Twitter execs seemed to treat moral statements not as complementary parts belonging to a hierarchical set of self-consistent principles, but more like random, vague, contradictory, and ill-conceived tweets fluttering through the timeline of a schizophrenic. This was evident when Dorsey talked about his “four indicators” of platform health: shared attention, shared reality, receptivity, and variety of perspective. There are no principles here; no philosophical approach to what Twitter should stand for, other than an ill-defined notion of “health.” These are merely platform attributes Dorsey hopes to be able to measure and “balance,” and it’s a transparent attempt to put the window dressing of pseudo-moralistic language on an otherwise pragmatic business concern (more people on the platform). Without a moral compass, Twitter is doomed to drift listlessly from crisis to crisis, hoping to stay upright amidst the growing waves of discontent. For a company full of engineers, the direction of Twitter is surprisingly anti-scientific. “The more control we can give people to vary the spectrum on what they want to see,” Dorsey explains, “that feels right to me.” As long as he feels good about it, I guess we’re safe. It’s not like the fate of Western Civilization is potentially at stake or anything. No need to brush up on your John Locke, @Jack, so long as you avoid spicy food. It’s also not clear that Twitter even understands the extent to which their rules impact political discourse. Russian bot accounts aside, Pool repeatedly tried to explain that in the United States public dialogue is regulated only by US law (which, thanks to the First Amendment, is pretty permissive), and that any additional restrictions placed on speech on a particular platform necessarily distort the discussion taking place on that platform. Such a discussion will, by definition, deviate from what would otherwise occur, and this could have serious political repercussions. This is almost self-evident, but Dorsey and Gadde seemed to be willfully dense about it, steering the conversation back to interference by governments and bots, and emphasizing the fact that they’re globalists. But they’re also liars, because when Pool mentioned the word “intersectional” in the context of social justice politics, both Twitter executives feigned ignorance. “What does that mean?” Dorsey asked. Apparently, the leaders of a company that bans people for tweeting, “men aren’t women,” have never heard of intersectionality. Maybe take an elevator downstairs, walk out onto Market Street in San Francisco, and ask a rando. Let’s face it, it’s insanely arrogant to believe that your job is to manipulate the interactions of millions of people around the world to promote a “healthy public conversation.” But this is what Jack Dorsey believes. He’s not shy about that. He believes that people can’t be left alone to have conversations because sometimes they might say insulting things, or be jerks, or be wrong, or be ignorant, or have uninformed opinions, or disagree with what everyone else thinks is right. He believes he has to detect when too many people are coordinating a “fake news” campaign and hide it from you because you’re too stupid to think for yourself and you’ll never learn the difference between trusted sources and hearsay like CNN. He believes that if too many people say rude things to you, you might run away and abandon his platform, and he believes that is very definitely a bad thing. He believes he knows what public discourse should look like in terms of tone and civility. He believes you need to be tamed. He believes he can figure out what memes like #NPC or #LearnToCode mean in real time, even when many of us aren’t always sure and might sometimes disagree. He believes he should monitor your offline behavior to help him understand what memes like #NPC and #LearnToCode mean so he can figure out whom to ban. He believes the reason you are angry with Twitter has nothing to do with the company’s ideology, its arrogance, or its hypocrisy. He thinks the problem is that he is “not great at explaining intent” to you. If he were better at it, you’d get it. You’d understand. Jack Dorsey thinks that if he gives you the right incentives and disincentives, then your behavior will evolve in a direction that he believes is healthy. After all, animals respond to incentives. They evolve. The odd thing is, he also believes the opposite. He believes that that no matter how much he rewards you for taking offense at what other people say, no matter how gratifying he makes it to see your nemesis banned from Twitter for disagreeing with you or for using the wrong trigger word, you won’t evolve. You won’t learn to take offense even more and more easily, in a gradual descent into dysfunctional hypersensitivity. He believes that will never happen. After all, animals don’t respond to incentives. They’re animals. They don’t evolve. Right? In recent months, Twitter has been thrust onto the front lines of an increasingly cataclysmic culture war with dire moral and political ramifications, but none of the generals seem to understand what they are fighting for, or even who is on whose side. The strategy? Rely on a set of survival instincts gleaned from the tired pragmatism of Silicon Valley’s dusty executive playbook, being careful to regularly consult the horoscope of pop culture’s trite moral relativism. It’s a recipe for oscillating between impotence and disaster. No wonder @Jack is worried.